This post originally appeared in fiberfacts.org and can be read here. We’ve all seen the child who refuses to take even one bite of the steamed carrots on his or her plate, yet gobbles up the macaroni and cheese right next to it made with mashed carrots in the sauce. For many parents, this may feel like a nutrition success story, but is it really? When children will only eat vegetables if they are hidden in something they like, they are missing an important lesson about the foods that make up a balanced diet. That is why I’ve always recommended “blending” instead of hiding foods to help children recognize and appreciate the contributions made by every food group to their health. This lesson applies to teens and adults, as well. Blending more vegetables (or other nutrient-dense food) into a recipe isn’t just a good way to enhance the nutritional value of a meal, it’s also a great way to extend the yield or lower the cost without significantly changing the look, texture or taste of the dish. It is also a valuable way to reduce food waste, like blending the heels of white and whole wheat bread to make bread crumbs for a meatloaf. Another big benefit of blending is the way it can help close the gap in our intake of dietary fiber since many higher fiber foods blend well with the foods people regularly eat, such as smoothies, hamburgers and brownies. And since eating habits are so hard to change, blending a new food into an existing dietary pattern is a practical way to get more fiber into meals and snacks without having to give up the foods you already enjoy. Blending is a great way to stretch or extend a recipe so you get a few more servings while increasing the fiber content. One way is to add a 15 ounce can of rinsed navy beans to a 28 ounce can of baked beans. There’s enough sauce in the baked beans to flavor the additional beans, but you’ll end up with ten half-cup servings instead of six, and each will all have more fiber and less sodium and added sugars than the original can of baked beans. Similarly, a cup of canned mixed vegetables can be blended into a can of vegetable soup to extend the servings from two to four while increasing the fiber content in them all. And any recipe that starts with simmering diced vegetables, such as onions, carrots, and celery will taste even better and be higher in fiber if you extend the amounts of the vegetables called for. You can even add a cup or two of complementary frozen vegetables to a stew or soup simmering in a slow cooker during the last hour to extend the fresh ones added in the beginning. Ground meat, poultry or fish mixtures used to make things like meatballs, croquettes and fish cakes are an ideal place to blend in high fiber whole grain crumbs to “enhance” the fiber content. Crushed whole grain cereal or cracker crumbs can also be used or oatmeal. 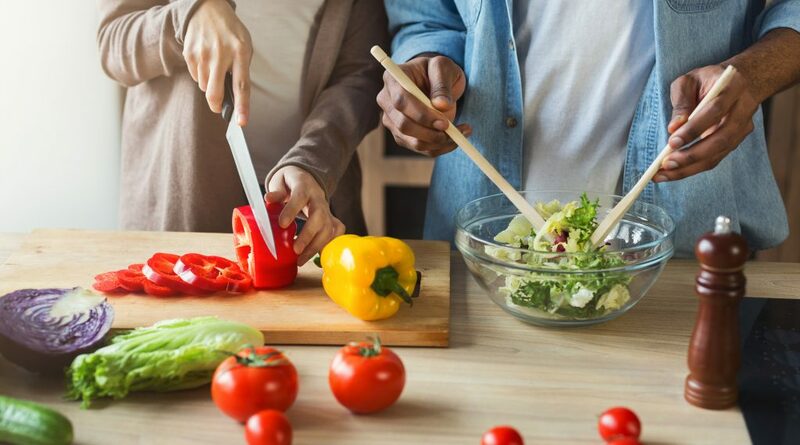 Stuffing mixtures made with white rice to fill peppers, acorn squash, and other hollowed vegetables can be blended with whole grains, such as brown rice, bulgur or barley to easily enhance the fiber content. And when making quick breads and muffins, part or all of the all-purpose flour called for can be blended with whole wheat or white whole wheat flour to boost the fiber content. Sweet potatoes are true to their name and the purple ones are even sweeter than the orange. When peeled, cooked and mashed they can be used to make much more than pie. Look for recipes that blend sweet potatoes into the batter for brownies, donuts, cookies and other sweet treats to replace some or all of the sugar and flour while increasing the fiber. Sweetness and fiber are also available by blending pureed dates into recipes for granola bars, pudding, fudge and more. Don’t overlook the many ways to sweeten a smoothie without sugar and increase the fiber by using naturally sweet and fiber-rich fruits and vegetables like carrots, apples and mangoes. Beans, peas and lentils are true superfoods due to the many vitamins and minerals they contain, the plant-based protein they provide and the great source of fiber they add to any diet. Even more important to their superfood status, they are inexpensive and available everywhere all year long. To bulk up the nutrition and fiber profile of any meal, all you have to do is blend in some beans. Try using pureed beans or lentils to thicken a soup or make a sauce. You can bulk up your Bolognese with kidney beans or your guacamole with green peas. Pureed beans can also be added to cake batter for a more moist and dense dessert. Popular recipes include black beans in brownies, cannellini beans in coconut cake and baked beans in spice cake. The options are endless! In every example I’ve provided, and those you come up with on your own, it is important to remember that the goal is to celebrate the benefits of blending more high fiber foods into your meals, not to hide or disguise them.